Mitzpeh | Ever wonder what goes into setting up Israel Fest? Here’s the rundown. Ever wonder what goes into setting up Israel Fest? Here’s the rundown. 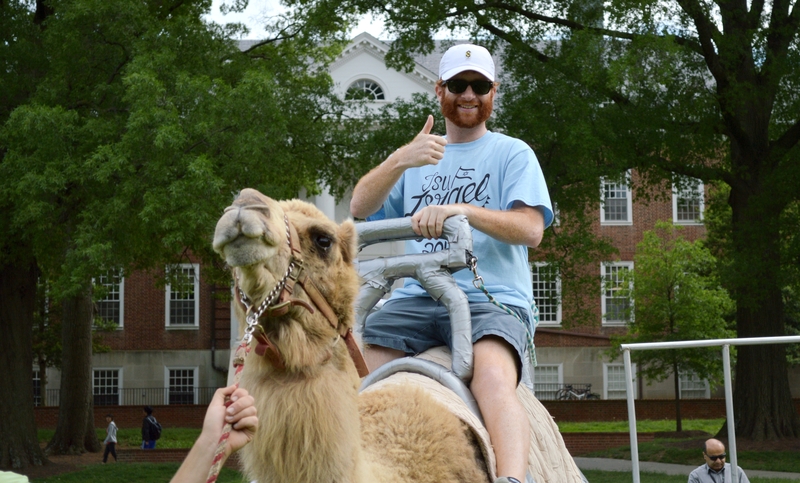 The people at this university celebrated Israel Fest on Tuesday on McKeldin Mall. But behind the free food, rock wall and camel went a lot of work into organizing this celebration of Israel. The Maryland Jewish Student Union hosts the event every year to end Israel Week, an event that occurred between April 25 and May 2 this year and featured a talk by Israeli journalist Lucy Aharish and a comedy event by Jewish comedian Benji Lovitt. Maryland Hillel, as well as other new sponsors such as Maryland Cru, co-sponsor Israel Fest. Like the rest of Israel Week, the event featured several Israeli themed activities, including falafel tasting, which allow people to learn more about Israel’s diverse culture. Along with the classic activities such as the rock wall and camel rides, this year’s fest featured new activities, such as a silent disco. There was also a laffa bread maker at the event, which will make a type of middle eastern flatbread, also called taboon bread. But making the activities a reality isn’t easy for the JSU to pull off each year. “It’s a huge process,” said JSU President Sam Fishman. Fishman said each part of the event requires planning and time in order to make it happen. Co-sponsors need to be contacted, catering for the food needs to be arranged, and decisions and plans for activities featured at the event must be made. The organization must also to make sure people are aware of the event and will participate. For this purpose, JSU also devotes some time to advertising and publicity for both Israel Fest and Israel Week. JSU also keeps in contact with different administrators to make sure every part of the event follows university rules. Fishman said one of the most difficult parts of the process is in the last week before the event when everything must come together and there’s less time for the organization to solve problems. For Hillel, set up for the event is mostly logistical. Organizers mostly figure out how many tents, tables and booths are needed for the event. They also need to decide how early that set up needs to happen and how everything needs to look. Students handle most of the details, such as planning the activities. Right before the event starts, event organizers from Hillel and JSU need to be at the mall to help the vendors set up, which can be difficult. Weather can also play a role in how the event is set up. Event planners had to prepare booths and tents for the heavy wind Tuesday. “We had to break out some extra things to hold the tents down or tape to tape all of the tablecloths together,” said Hillel Operations Associate Alyssa Silva. Although it is a long and difficult process, Silva said the chance to educate students about Israel makes the effort worth it. No Replies to "Ever wonder what goes into setting up Israel Fest? Here’s the rundown."